Jamal Crawford Breaks Down his Crossover . 2013-01-23T18:00:00.000Z. ... Jamal and NBA Hall of Famer Gary "The Glove" Payton . 2014-10-24T14:11:22.090Z. Jamal Crawford breaks down his crossover. 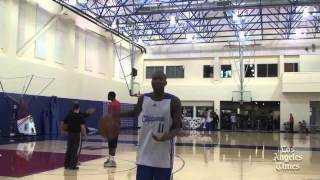 Jamal Crawford breaks down his crossover. 00:25. Is Russell Westbrook drunk? Is Russell Westbrook drunk? 06:46. Jamal Crawford vs Zach LaVine in Seattle Pro Am All-Star Game! NBA Pros Show OUT!